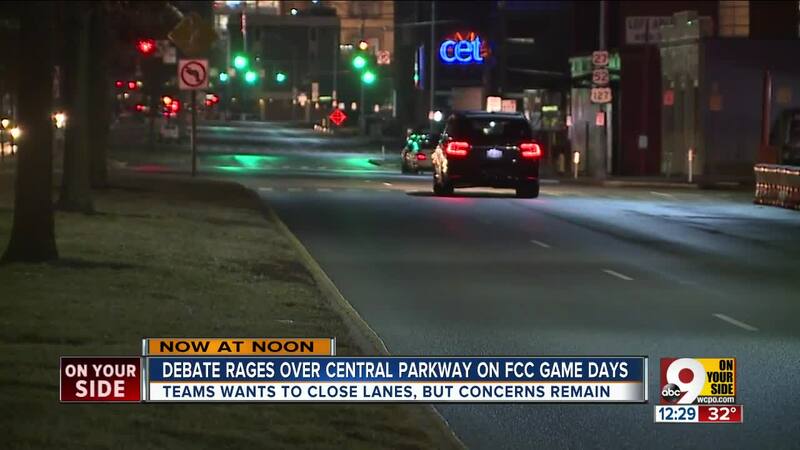 CINCINNATI — A majority of City Council members said they would reject any FC Cincinnati stadium plan that involved closing a portion of Central Parkway to vehicle traffic on match days. In a motion dated Jan. 23, Councilman Chris Seelbach wrote, "Central Parkway is a critical artery for our city, connecting numerous neighborhoods and providing a critical north-south artery for the core of Cincinnati." Council members Tamaya Dennard, Greg Landsman, P.G. Sittenfeld and Wendell Young also signed Seelbach's motion. "Traffic on adjacent streets (in West End and Over-the-Rhine) already hits critical mass during major events," Seelbach's motion continues. Initial stadium plan documents filed late last year included gameday schematics that called for authorities closing the parkway between 15th and Wade streets, the area that would hold the stadium's main entrance plaza. The plan also called for closing 14th, Magnolia, 15th, Odeon and Wade streets to all but local traffic between Central Parkway and Elm Street on game days. Game-day street closures are not uncommon: Numerous surface streets surrounding Great American Ball Park and Paul Brown Stadium at The Banks close for Reds and Bengals home games. Seelbach said this case is different. "Unlike the riverfront stadiums or (the University of Cincinnati), both of which predate residential development in their respective areas, the FCC stadium is being built into an already existing community," he wrote. Seelbach's motion circulated less than a day before a critical City Council Economic Growth and Zoning Committee vote Tuesday morning, which will determine if the stadium planning team can move forward its planned development or if they'll have to go back to the drawing board. The City Planning Commission approved the initial planned development proposal -- that's basically a zoning change for the site that would allow the team develop the stadium site -- in early January. Also Monday, an environmental noise study meant to assess the impact of the soccer club’s planned stadium on Music Hall’s performances found the anticipated level of game-day noise would overpower the carefully-calibrated acoustics of the hall’s main auditorium. Crews last wrapped year roughly $143 million in restorations to the historic landmark and event center that sits at the border of West End and OTR. Most of those restorations were financed through private donations. City Council approved in 2018 a bid to develop a Major League Soccer stadium in West End, at the site of the now-demolished Willard Stargel Stadium at Robert A. Taft Information Technology High School. The team also considered sites in Oakley and on the Northern Kentucky riverfront in Newport. Solidifying plans for a soccer-specific stadium was a key element in securing the club's MLS bid. The team will start its first MLS season this spring, playing at Nippert Stadium on UC's campus. The team has committed to hosting matches in its new stadium by the 2021 season. City Council's Economic Growth and Zoning Committee was scheduled to discuss the stadium site plans at its Feb. 5 meeting, at 10 a.m.